Inside: Extracurricular activities can be expensive, especially if you have multiple children. 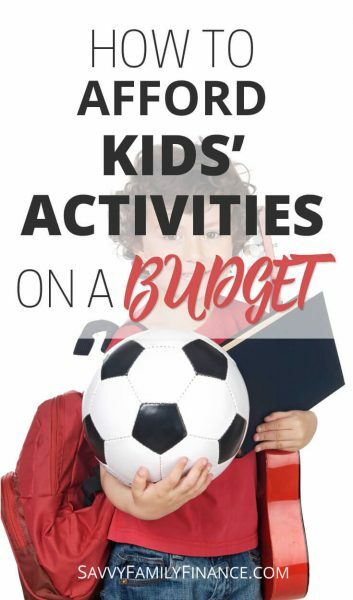 Here we have tips on how to afford kids’ activities on a budget. Providing rich experiences and letting your children try new things is something most parents want to do. Maybe you’ll discover your daughter is the next Alex Morgan or your son is the next Andy Warhol. Or maybe they just like to hang out with their friends and run around. Unfortunately, most organized extracurricular activities have various fees associated with them. Sometimes, it can get to be a lot. There are a few things you can do to lower costs while letting your kids try out different sports and clubs. Kids like to try new things, even if they are shy about it. Maybe their best friend is starting soccer, so they want to play as well. And another friend is taking guitar lessons. And you want them to take swimming lessons and, oooh, that after-school art class sounds like it would be fun. I get it. But if you give in and sign the kids up for all those, not only will you strain your wallet, but the kids will be hungry, cranky, tired and throwing tantrums. If you have more than one child, multiply that. Plus, you’ll be living out of your minivan and spending a ton on gas. Like us, kids need downtime. Let them play, let them be a bit bored. Both the kids and your budget will be happier in the long run if you limit the number of activities. Maybe you want to try one activity per season. Or you can try one sport plus one of something else, like music lessons. Also, have a season off or at least mix it up season-to-season to the body can recuperate and the kids aren’t bored. By doing this, you’ll have more time with your family, more time to relax, and a bit more money available for other things. As with magazine and TV ads, you often don’t get the whole picture up front when first looking at a new activity. Sure, signing up for the soccer league is $200. For the fall. Then there is the winter futsal, spring soccer, summer tournaments at $100 each. Oh, and the $200 kit and make sure to buy shoes and shin guards. Before you know it, you are spending over $1500 for your 8-year-old to play on that elite soccer team. Even if your child is older and it maybe makes sense to try out for the competitive teams, ask other parents about hidden costs and fees. You are going to want to prepare your budget and maybe even have your child drop another activity so the family can afford her favorite. And it isn’t just sports. With music lessons there are rental fees, book costs, and even recital fees. Similar expenses can crop up with art, dance, biking clubs and almost anything else you can think of. Ask other parents or the instructor for a list of any and all costs associated with the activity so you are prepared. Sometimes it makes more sense to rent equipment rather than buying. This makes the most sense with musical instruments. Kids will outgrow smaller instruments or even lose interest. At least until the child has grown and maintained interest for several years, renting will likely save you money and time in the long run. Some places that rent instruments may even apply some of the rental fees towards a purchase. When kids are younger, they want to try a ton of different things out, and that’s awesome! One year they may try baseball, then soccer, then football, then swimming, then hockey, then skateboarding, then chess club. Imagine buying new equipment for all these sports. And I’ve known kids that have gone through a similar list over the period of only two years! The cost of all that equipment and uniforms has to be staggering. But, because so many kids do bounce around trying different activities, chances are you can find used uniforms and equipment in good condition. Other parents may be willing to give you a deep discount or just give you hand-me-downs for free. Otherwise, check out Craigslist or places like Play It Again Sports for gently used items you can buy. If money is especially tight, ask the principal, coach, or director about possible scholarships or a sliding fee schedule. Often, they are willing to work with families so the kids can take part in activities. Before signing up for private music lessons or that expensive sports team, find out if the schools or local community centers offer something similar. Around here, a month-long beginners gymnastics class a the local community center may cost $40 but the local gymnastics center charges $83/month plus a mandatory $40/year family fee. And that is for pre-schoolers. If I’m uncertain my child will love the sport or even be good at it, I’m going to choose the community rec center. And you know what? Sometimes they even share some of the same instructors. The other great thing about community centers is that you aren’t signing a contract for extended payments. You can try the classes. If you like it, great! If not, then don’t sign up again. With all the fees, uniforms, supplies, and equipment, keeping your kids active and entertained can get to be expensive. Try using some of these tips to save money while your children experiment with new sports and hobbies. It just may be possible for the family to enjoy kids’ activities on a budget. How do you save money on extracurricular activities?